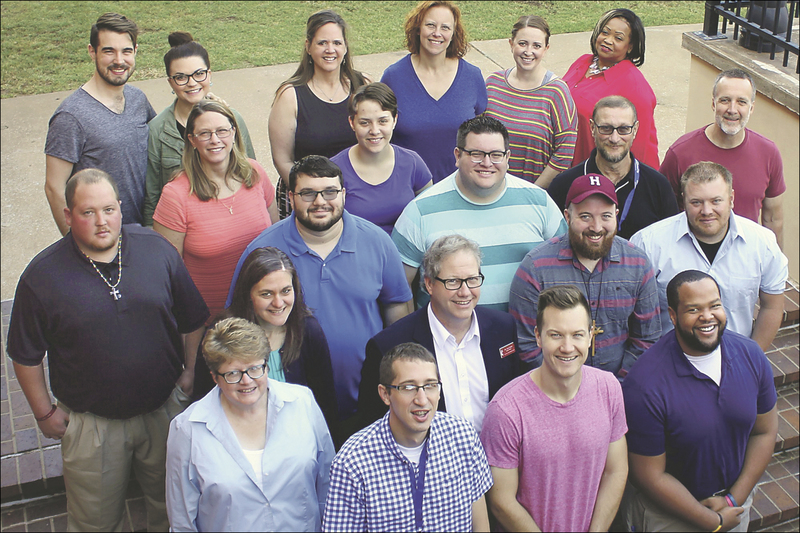 19 candidates attended the annual Local Pastors Licensing School, held June 23-30 on the Oklahoma City University campus. In photo, the class and leaders are named FROM RIGHT in each row. Front row: Kevin Tankerson, Sam Donica, Graeme Collett, and Sheri Wymore. Second row: Matt Borum, Trey Witzel, James Graham, and Colleen Runty. Third row: Thomas Langhofer, Keith Smith, Jake Tatarian, Ayrika Watson, Spencer Branch, Christine Noland, and Ryan Sims. Back row: Gwendolyn Derrick, Alison Haynes, Jessica Maynard, Nancy Johnson, Emily Robnett, and Michael Robnett. Revs. Johnson and Graham are co-deans. The training is underwritten by the Conference’s Board of Ordained Ministry and the districts; students also pay a portion.